Later this year the massive stadium in Nizhny Novgorod's Strelka district will get its first non-sporting facilities. Subject to public vote, a 3,000-square-meter medical centre is planned. 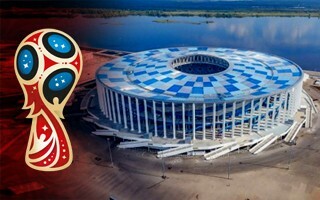 Though the Nizhny Novgorod Stadium has only three more games of the World Cup left, there's still no detailed strategy of its post-tournament use. First confirmed facility to open its doors is a medical centre, expected for the second half of 2018. The sport-focused medical centre is expected to cover 3,000 m2 within the stadium. It's part of the region's socio-economic development strategy, which will be subject to public vote on September 9. While it's an important step, we should note that the stadium has almost 69,000 m2 of space for use, only part of which is taken by permanent sporting and hospitality zones. As of now there is no long-term plan of how to make the stadium entirely occupied. Estimates from 2 months back put the annual operating cost at massive RUB 300 million (almost $5m), which is largely associated with transition to permanent-use mode, including filling the floor spaces. Though the public administration has repeatedly assured taxpayers that the stadium will be financially viable, many commentators doubt it. During an economic forum in May majority of experts were sceptical of the stadium ability to break even, only countered by further assurances of public officials, who are responsible for the stadium.